The first volume in CROSSROADS OF FATE, a unique science fiction series, is now available on audio! HC Playa’s DAUGHTER OF DESTINY is now a top quality audio book produced by Radio Archives. Captain Zane Gratig of the Inter-Galactic Confederacy Fleet is on a routine recon mission to investigate Earth. During a telepathic exercise, he stumbles upon Katarina’s vibrant mind. Though forbidden by intergalactic laws, neither Zane nor Katarina can stop destiny and love from uniting them. Meanwhile, a Goloth invasion force prepares to conquer Earth and from there reclaim the empire it once ruled across the known universe. Kidnapping and torturing Zane are just step one in the Goloth emperor’s plan. Separated by galaxies, forbidden by laws, Katarina and Zane must find a way to come together to face down their enemies and guide Earth on its new path. 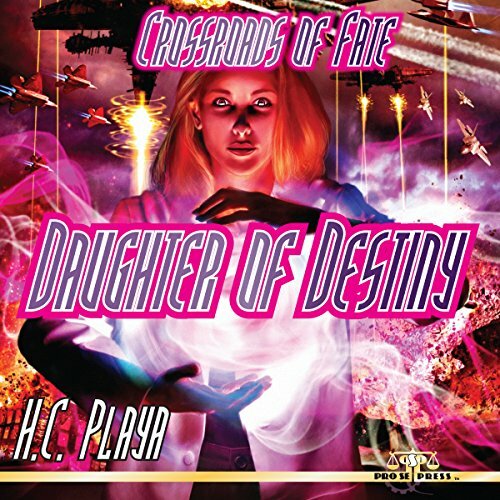 DAUGHTER OF DESTINY by HC Playa. From Pro Se Productions. This exciting science fiction fantasy audio book is also available on Audible and Itunes. DAUGHTER OF DESTINY is available in print and digital formats at Amazon and www.prose-press.com.